Keeper Blog: Blooming Butterflies is a blooming success! This weekend was the grand opening of Blooming Butterflies, a summer exhibit of butterflies from around the world. Thousands went through the giant caterpillar shaped building this weekend, taking countless numbers of pictures. Children and adults alike reached out their arms hoping to supply a landing spot for the approximately 500 butterflies fluttering throughout the exhibit. One gentleman I spoke with had gone through three sets of batteries for his digital camera! Another was taking pictures of all the plants in the exhibit to bring to his landscaper to attract butterflies at his own home. Blooming Butterflies is a great resource for getting some amazing shots of butterflies. I saw people taking pictures with disposable cameras, cell phones, and some super high tech digital cameras with lenses longer than my arm. Even the amateur photographer can get a great picture as the butterflies literally are close enough to touch, although we ask that you don't touch them, rather let them touch you. I think it is great to see the delight on the visitors' faces when a butterfly swoops past them or lands on them. They are truly amazing creatures with such a wide array of colors and patterns. 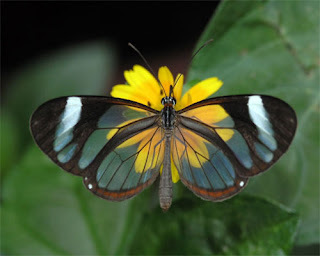 My favorite so far is the Glasswing Butterfly. We only have a few flying through the exhibit and they are difficult to spot because they are small and their wings are transparent except for the edges, but they are simply gorgeous! Blooming butterflies will be open all summer long with new butterflies being released into the exhibit on a regular basis. Stop by and test your photography skills.